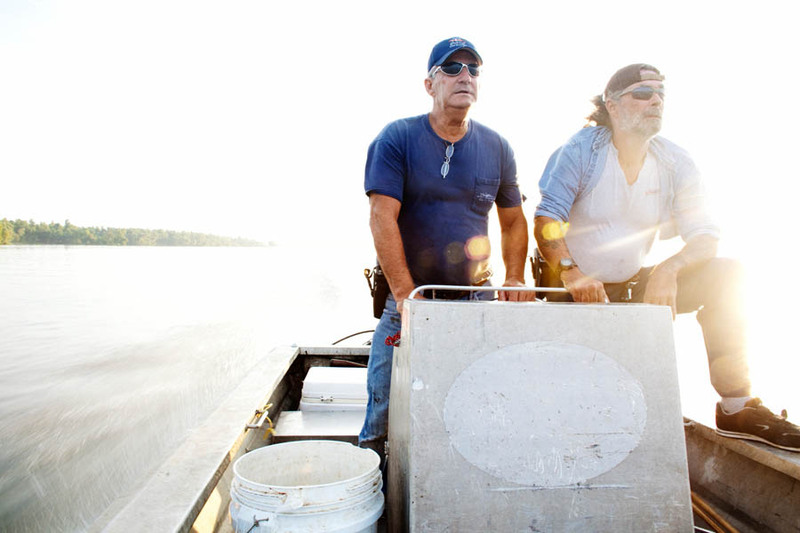 Julius Gaudet, 62, (L) and Rebel (R) glide over the tranquil surface early in the morning as they begin their day hunting for alligators near Shell Island, Louisiana on September 19, 2009. 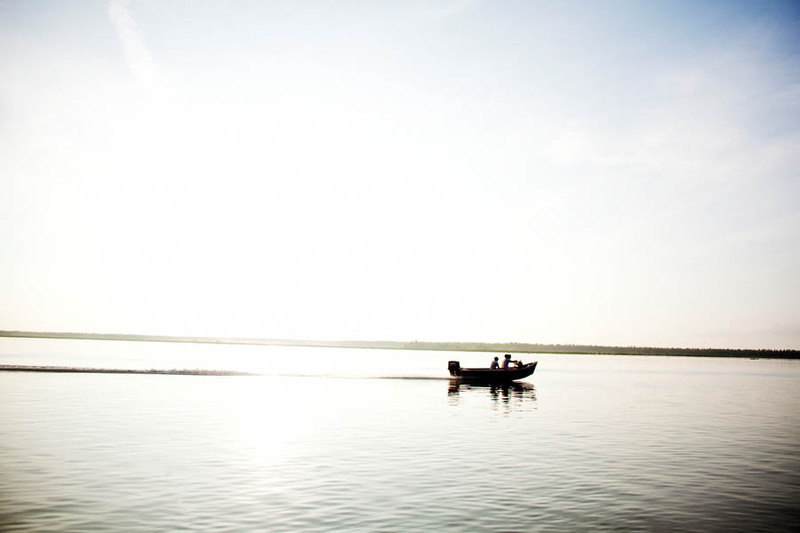 A boat of "weekend warriors" glides over the water next to the boat manned by Julius and Rebel as they leave early in the morning for alligator hunting near Shell Island, Louisiana on Saturday, September 19, 2009. "Weekend warriors" is a derogatory term the locals apply to individuals who come to the river for recreation. 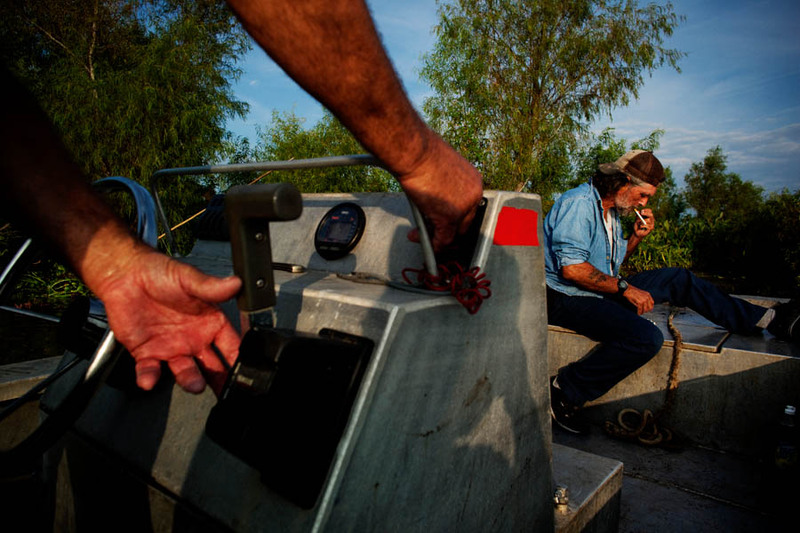 Rebel smokes a cigarette after checking a line as Julius maneuvers the boat to the next baited line on their route. 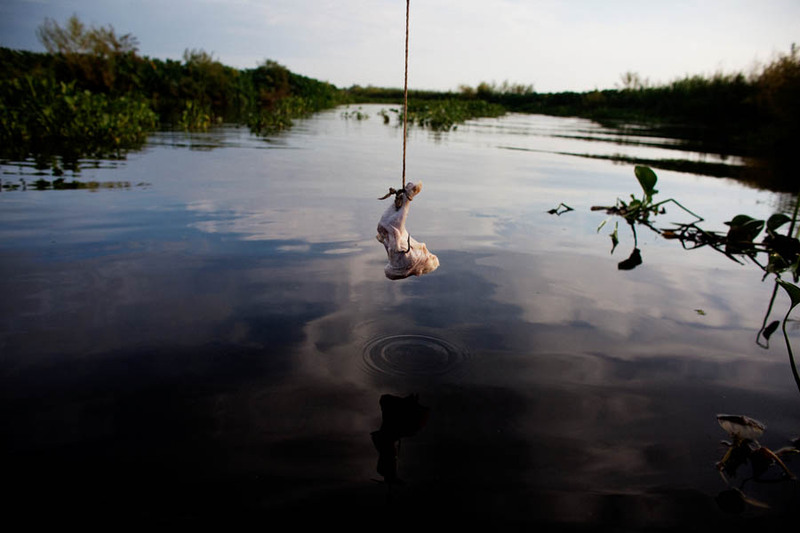 A baited hook hangs low to the water of Shell Island, Louisiana where commercial gator hunters Julius and Rebel are part way through the annual alligator hunting season. The state of Louisiana is home to the largest alligator population in the United States, estimated to be almost 2 million. Alligators are North America's largest reptiles and are considered a renewable resource in an industry that has thrived in America's deep south for centuries. 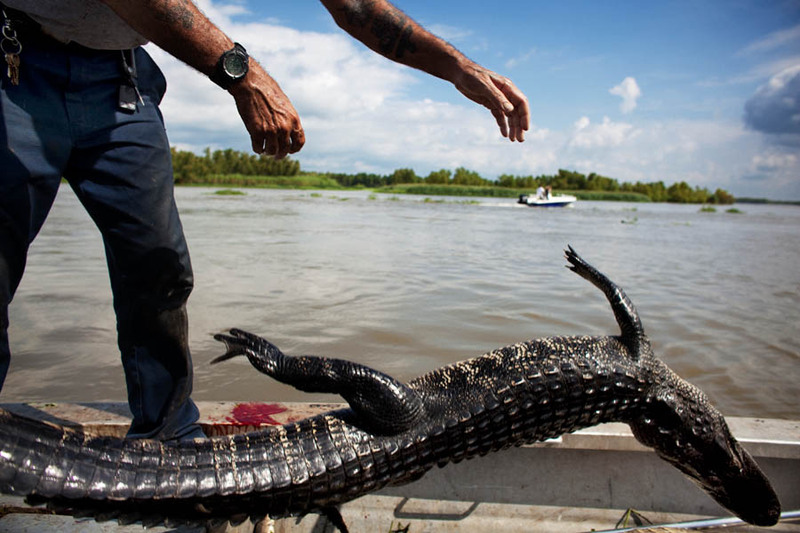 The first large alligator harvests occurred during the early 1800s. The alligator farming industry in Louisiana alone annually harvests 140,000-170,000 gators which are valued at over $12,000,000. Julius and Rebel work to haul a recently caught gator into the boat. 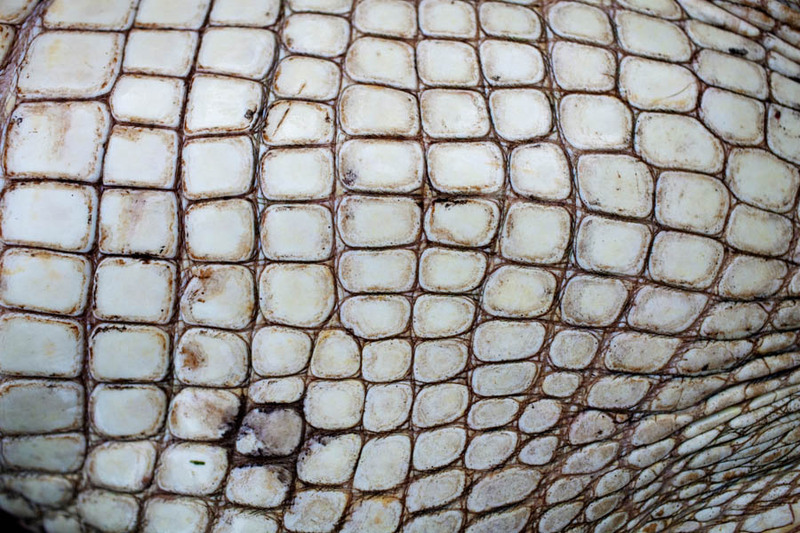 The underbelly of an alligator. 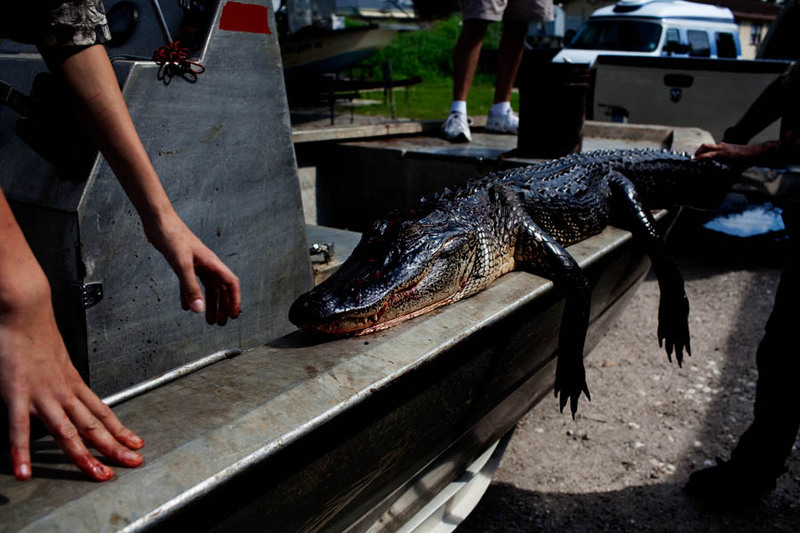 Recently caught alligators lie on the bottom of the boat as hunters search for more. Rebel eyes the shore for a gator that had taken the baited line into the reeds. 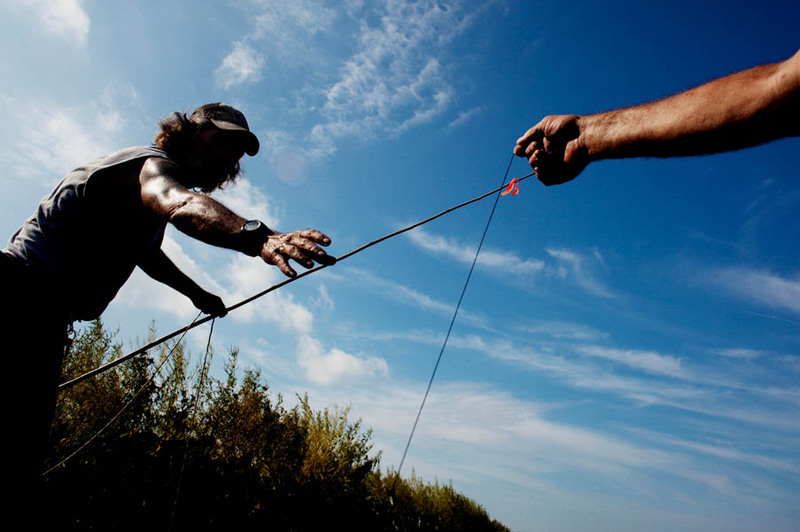 Julius hands Rebel a line while baiting a rod. 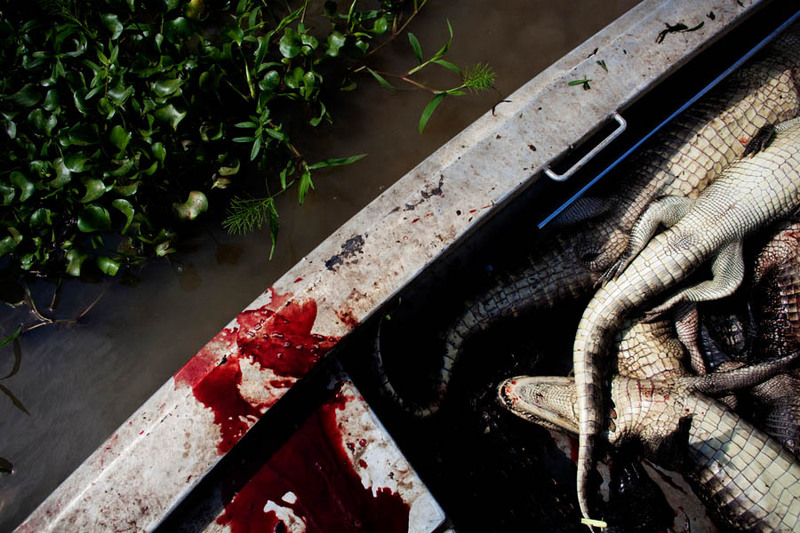 Bodies of recently caught alligators line the bottom of the boat. 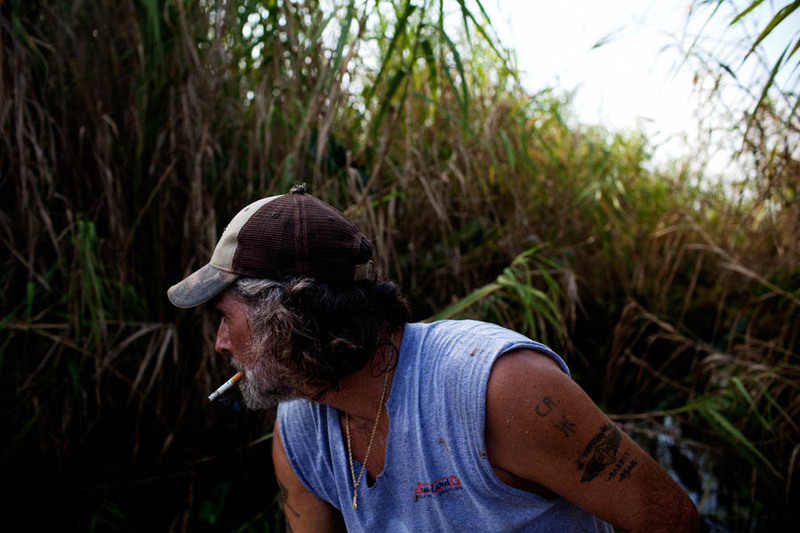 Julius and Rebel average nine gators a day, but this day landed thirteen. Rebel tosses a recently caught gator into the bottom of the boat. 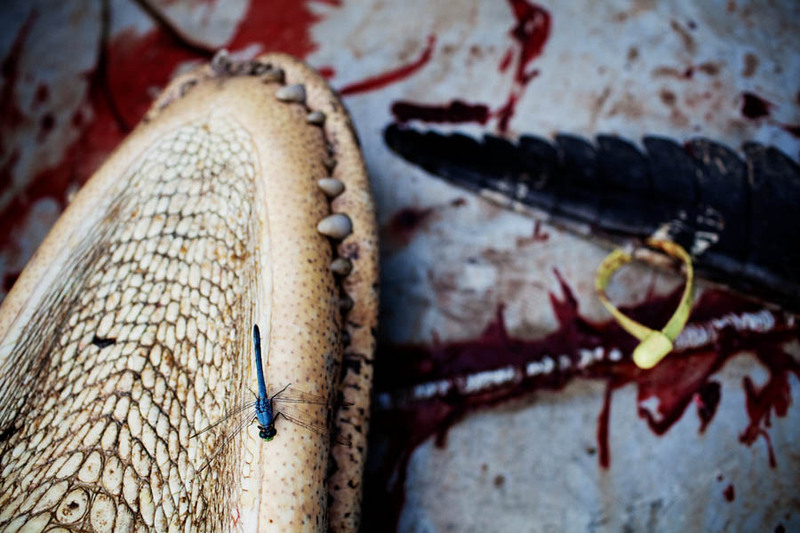 A dragonfly comes to rest on the jaws of a recently killed gator. 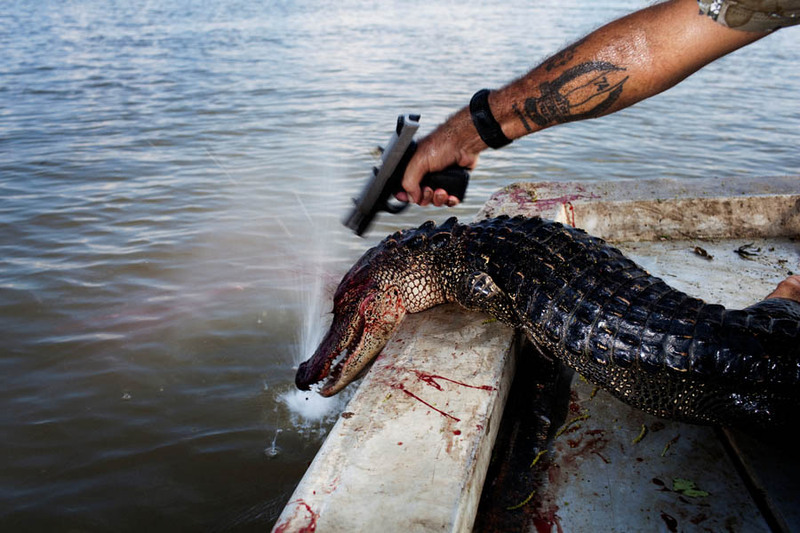 Rebel plants a second bullet in the head of a gator that kept moving after being hauled into the boat. 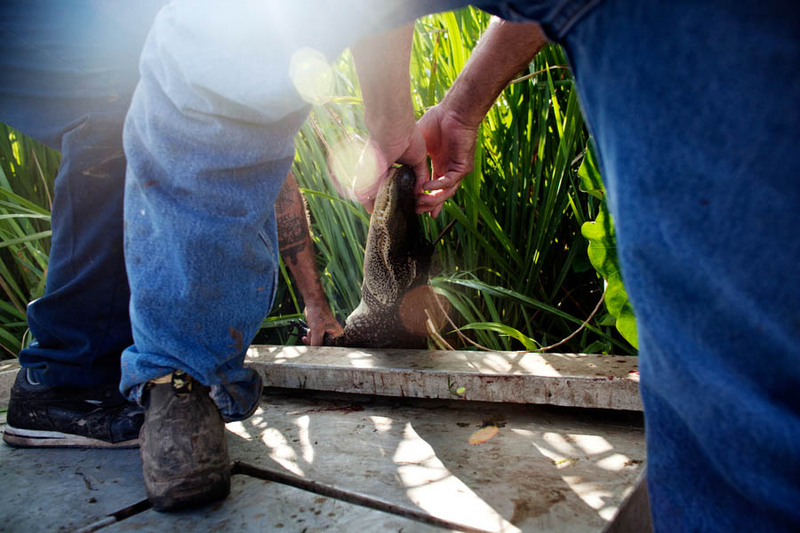 Each gator is then tagged before being piled in the bottom of the boat. 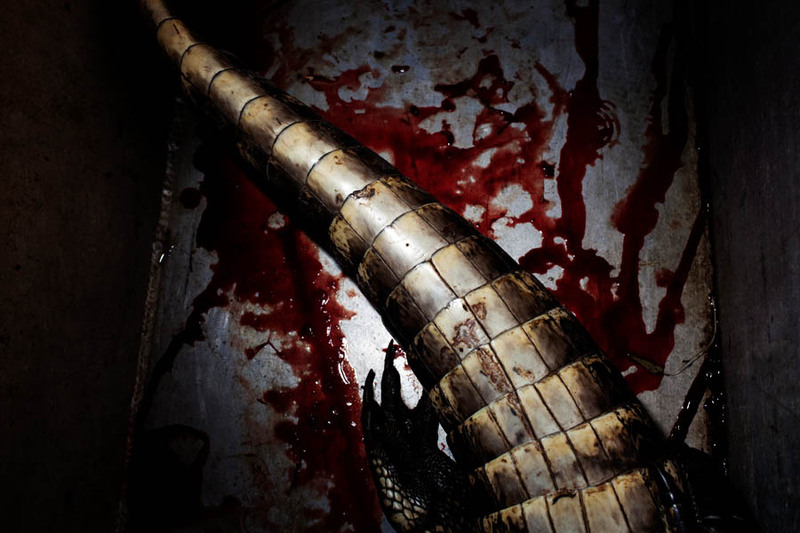 An alligator lies in a pool of blood on the floor of the boat while alligator hunting. 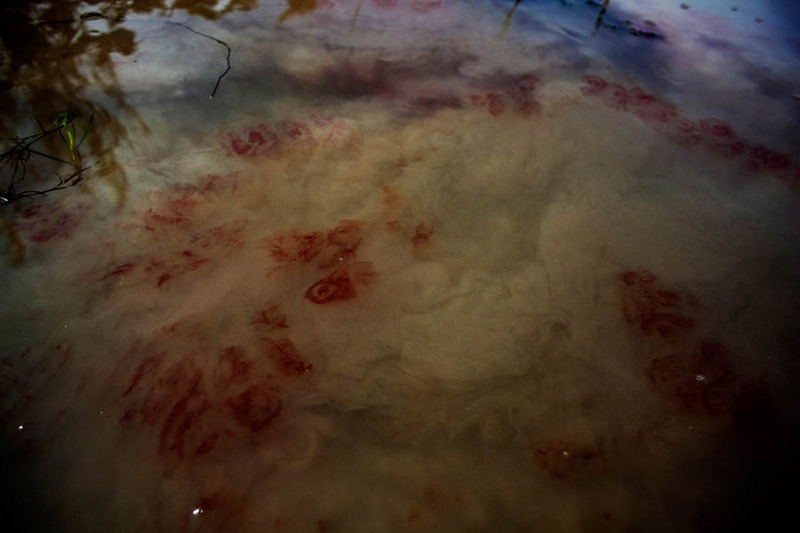 Blood mixes with mud stirred up from the bottom by the boat motor and fighting alligator. 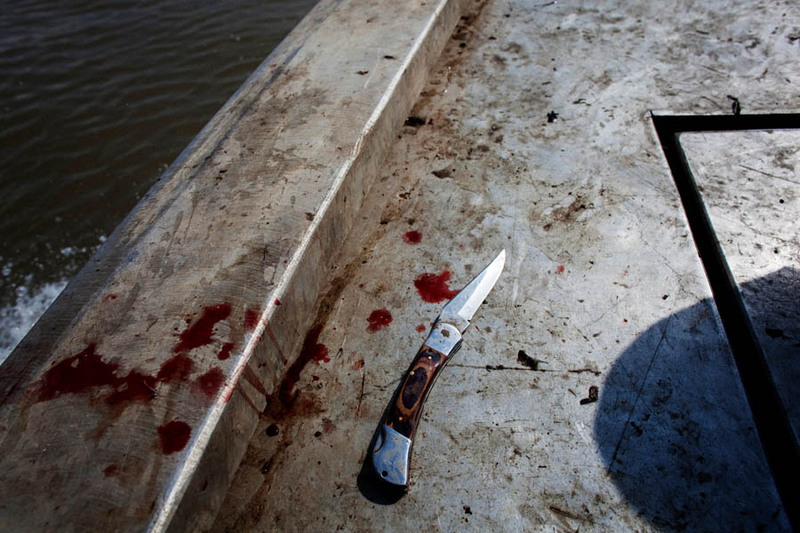 A knife lies by drops of blood on the bow of the boat as Julius and Rebel hunt for alligators. 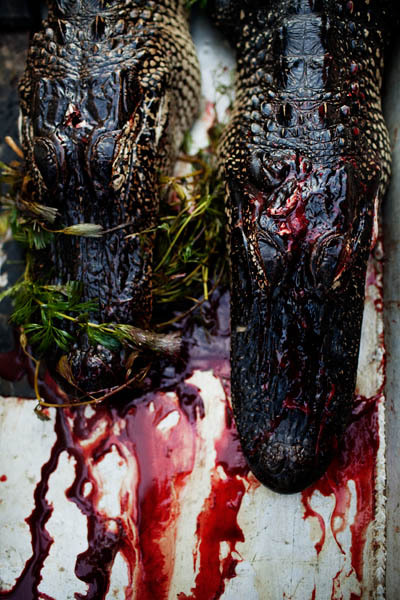 After an alligator is caught the hunters cut a small slit in its tail through which they put a numbered tag, in accordance with the hunting regulations. 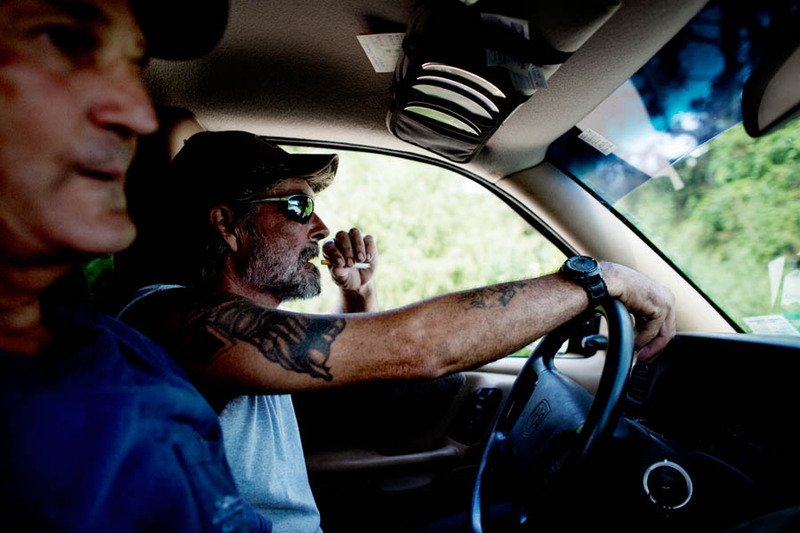 Julius and Rebel drive to get beers after a day hunting. 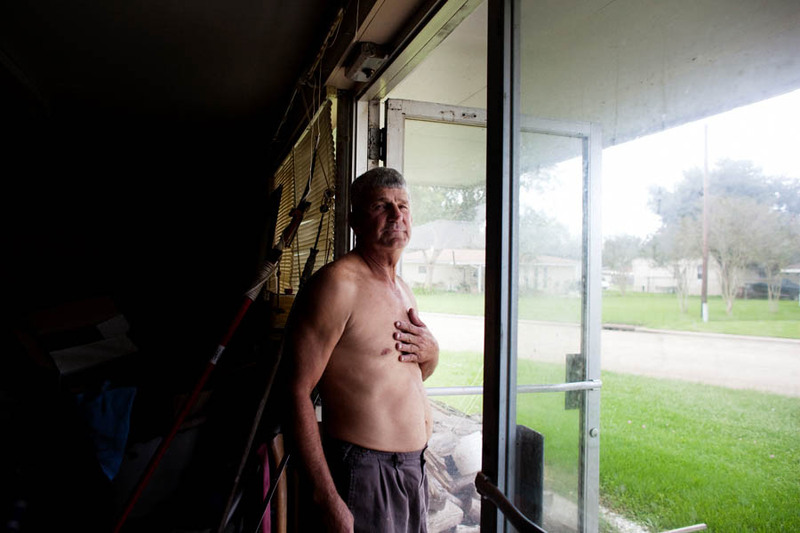 Julius stands in the doorway of his garage after a day of hunting. 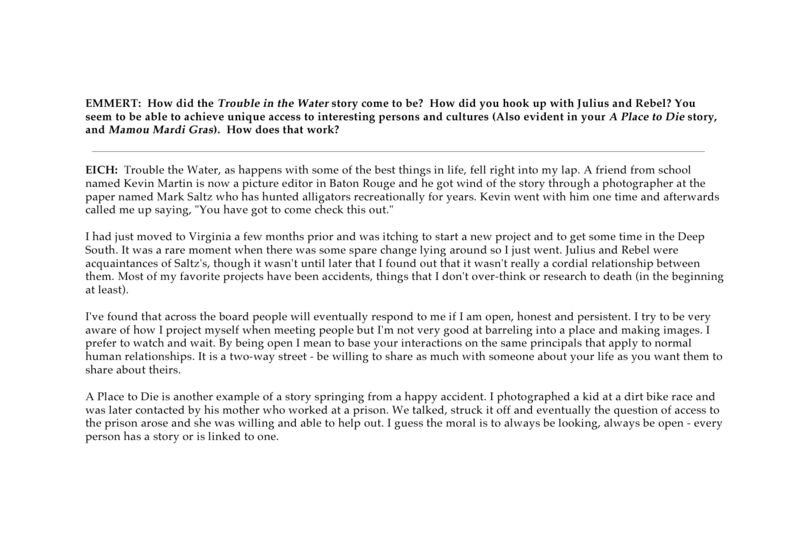 Following a day of hunting near Shell Island, Louisiana, the catch of the day is measured and recorded. 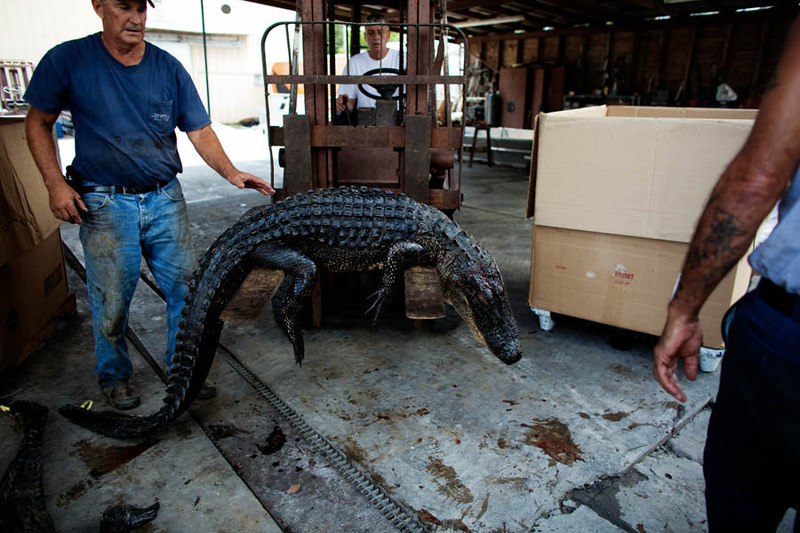 A forklift is used to lift an alligator into a cardboard storage box. 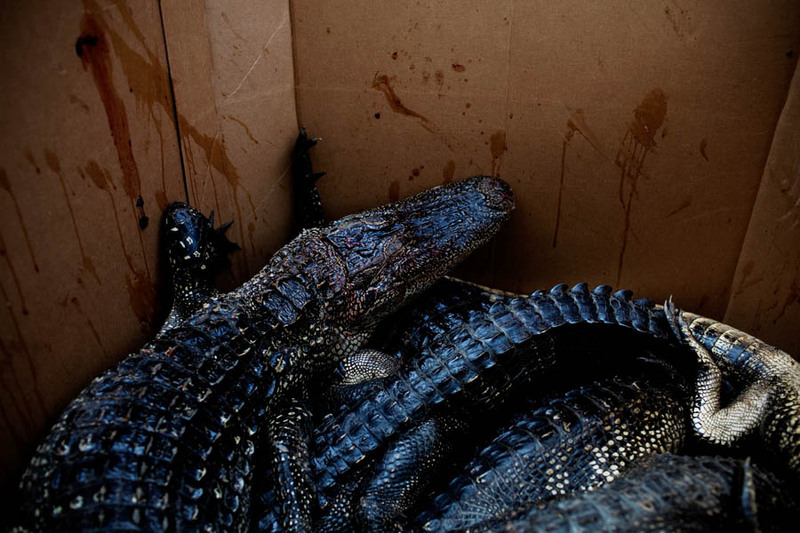 The gators are then placed in cold storage in large cardboard boxes until the hunters have run out of tags. They are then delivered to someone who skins the animals and processes the meat, returning the skins to be sold.